It is summertime and I have 4 kids so that means I have a lot of responsibility. Each day I try to plan one activity for them to do. 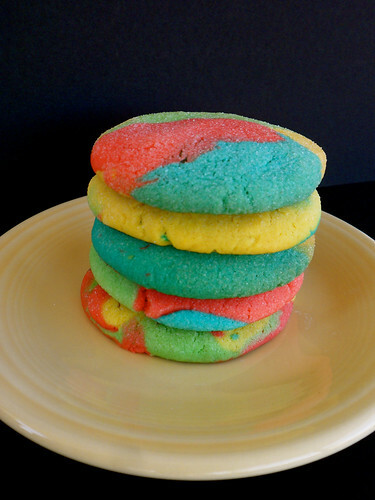 Today it was Rainbow Almond Sugar Cookies. The kids had a lot of fun making them. Next time I make them I think I will go with just vanilla extract in the mix, the almond is a new flavor for my kids and the pickiest one is not digging it. I used Bake at 350 sugar cookie recipe but added salt. In your mixing bowl cream butter and sugar until well mixed. Add your vanilla, almond extract, and egg until well mixed. Add dry ingredients until the ingredients are combined. Dough will be crumbly. Take out of bowl and knead by hand for a couple of turns. Shape dough into a round and cut into four equal pieces. Choose your colors (we used red, blue, yellow and green) and put 1/4 the dough back into the mixer with the dye. Mix until incorporated. Do this step with the remaining dough. After you have the dough colored cut it into small pieces (about 1.5 inches by .5 inches). Use 4 – 5 pieces of dough and roll them into a ball. Flatten ball like a hamburger and place in bowl of sugar. Lift cookie dough from bowl and place on a cookie sheet sprayed with cooking spray.